We provide skip bin hire 6 days a week – Monday to Saturday. You can rely on us for competitive pricing and hassle-free delivery and pick. To get a quote or book a bin, give us a call on 0434 286 307 or use the booking form below. When you need to hire a skip bin, make Skip Bins Plus your first call! We’re looking forward to helping you with your clean-up. An addition council permit fee of $40 will apply for placement on road or nature strip in Brimbank. Albanvale, Albion, Ardeer, Brooklyn, Cairnlea, Calder Park, Deer Park, Delahey, Derrimut, Hillside, Kealba, Keilor, Keilor Downs, Keilor Lodge, Keilor North, Keilor Park, Kings Park, St Albans, Sunshine, Sunshine North, Sunshine West, Sydenham, Taylors Lakes, Tullamarine. Call 0434 286 307 or use the form below to get a quote. Call 0434 286 307 or use the form. Standard skip bin hire period is 1-3 days. We accept cash or credit cards. Payment is to be made at the time of delivery. We also access bank deposits. These must be deposited prior to delivery. Skip bins must not be filled above the rim. Overfilled bins will be charged accordingly. Bins filled with hazardous or inappropriate materials will be charged accordingly. 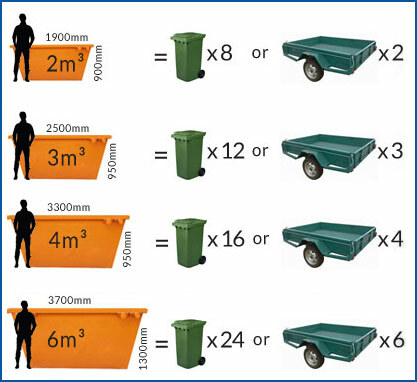 Skips placed on the road or on a nature strip are subject to council approval and additional costs apply. Prices for council permits are listed on our Service Areas page. Additional fees apply for mattresses & bed bases ($40 each), vehicle tyres ($20) and vehicle tyres with rims ($30). Mattress disposal is an additional $50 per item, regardless of size. The 2m³ skip is ideal for smaller clean ups and residential property clearance.